You may know them for their hit song “Flamingo,” but what does the rest of Kero Kero Bonito’s discography sound like? Before you start, press play below to listen to each song as I talk about it! 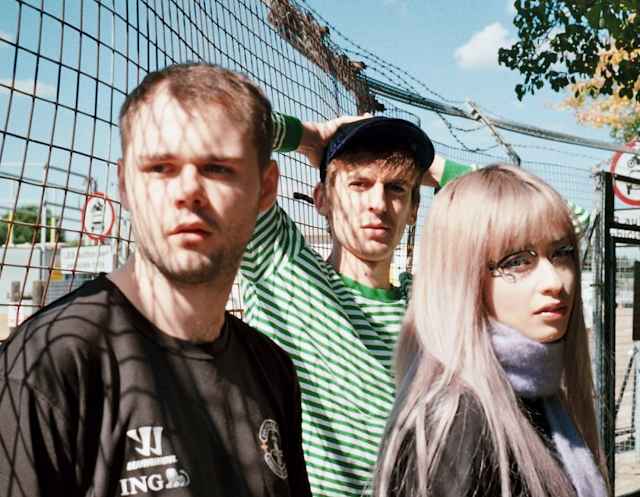 Kero Kero Bonito is a London-based indie group consisting of three members: Sarah Midori Perry, Gus Lobban, and Jamie Bulled. Upon their debut, KKB made music that sounded like nursery rhymes, but what made their sound more interesting was the dark underlying themes in the lyrics and the mix of English and Japanese. The group debuted in 2013 with the song “Homework,” from their debut mixtape Intro Bonito, which established Sarah as the vocalist and Gus and Jamie as the producers for the trio. “Homework” : The melody for this song is very easy to follow and does sound very much like a nursery rhyme. The transitions from English to Japanese, and vice versa, are great. The colorful music video, along with the upbeat song proclaiming a “positive” message, are deceiving. The song seems to be a satire of childhood beliefs. The lyrics appear to be ironic: “And all my friends can join me in my pool / When I’m very successful / Cause I worked hard at school / You don’t need to be jealous / Cause you can have this too / Finish all of your homework / And you will get rich soon.” The group mocks the statement that parents give to their growing children: doing your homework will lead to your success in the future. Whether or not this statement is true, Kero Kero Bonito seems to use themselves as an example of success, which is quite ambitious for an up and coming group. Additionally, it is especially ironic that amidst all of Sarah’s talk about success, a robot speaking in Japanese says, “Sarah, you are accused of tax evasion.” In terms of the music video, the colorful backdrop (and the song) figuratively darken once you realize the cartoon images of suicide that lay on the background behind Sarah. “Let’s Go To The Forest”: I enjoy the instrumental for this song, as it originally comes from the song K.K. Faire from the Animal Crossing: City Folk (Animal Crossing: Let’s Go To The City in Europe) soundtrack, but Kero Kero Bonito distorts it. The lyrics for this song also suggest a darker theme. Sarah sings about going back to the forest and ocean where she had fun with her imagination as a child; however, at the end of the song she sings, “Oh wait, the forest got demolished / When they built the airport years ago / But we can still go to the ocean / Cause they put it in a bowl at the mall.” The group sings about their perspective on industrialization and capitalism in terms of how it affected their childhood experiences. One month after releasing their debut mixtape, Kero Kero Bonito released one of their biggest songs to date, “Flamingo,” and proceeded to release their debut album two years later, titled Bonito Generation. “Flamingo”: A very, very, very, fun song. This single may have been what really got the group’s name out. The song spread around YouTube and other communities, as the song became a meme and edits of the song were uploaded and viewed. Other than that, Japanese and English are both still being used, the flute in the song is unforgettable, and the bass along with all the small sound effects just make me feel (uwu) happy. One of my favorite lyrics in the song is the following: “Black, white, green or blue / Show off your natural hue / Flamingo / If you’re multicolored that’s cool too.” When compared to the song “This Town” from Intro Bonito, where she talks about being called “strange” -- most likely due to her being biracial in Japan --, “Flamingo” shows how Sarah now embraces her racial identity as White and Japanese. “Trampoline”: A single off of their debut Bonito Generation. Like the rest of this album, “Trampoline” is a fun record that uses both the Japanese and English languages. The song talks about how a trampoline picks you up when you go down, and this song serves a similar function. The upbeat and positive message that come across as you listen to this song can definitely cure a bad mood. “First you fall down, then you jump back up again / Find your rhythm, momentum is the key / It’s so easy, anyone can trampoline / So jump on up and you can see / The whole wide world.” Compared to their debut mixtape, KKB’s debut album does not immediately appear to have any dark themes, but is instead a genuinely fun and positive album. “Make Believe”: Maybe the synth-pop is here to stay? Probably not. “Make Believe” is one of the singles off of Kero Kero Bonito’s newest album Time ‘n’ Place. This single is the one off of the album that is most similar to their older works in my opinion. An upbeat song with lyrics as the title suggests -- a song about dreaming and ignoring the fast-paced, real life world. Thank you, if you read this far!